Stores caught selling synthetic drugs face new penalties in D.C.
D.C. Council approved emergency legislation Tuesday that lets Police Chief Cathy Lanier shut down for 96 hours any business caught selling synthetic drugs that officials have attributed to a spike in violent crime. 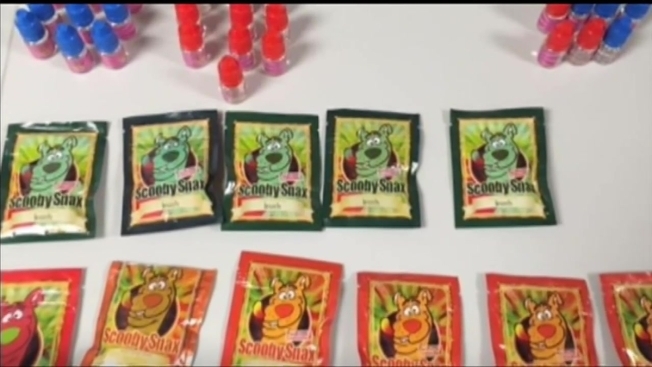 Businesses caught selling drugs that use names including Scooby snax, spice, K2, bizarro and train wreck will be fined $10,000 for the first offense and can lose their business license if they're caught a second time. "That is a victory for public safety in the District," Mayor Muriel Bowser told News4. What Is Synthetic Marijuana and Why Is It Gaining Popularity? Earlier this month, Deputy Mayor for Public Safety Kevin Donahue attributed the spike in crime in D.C. in part to the use of synthetic drugs. "We know that when we arrest people for violent crimes, almost 40 percent have synthetic drugs in their system," he said. Two people were rushed to a hospital Monday afternoon from near the Community for Creative Non-Violence homeless shelter, at 425 2nd St. NW. The shelter -- which is the largest in the District -- is the same location where groups of people overdosed on synthetic marijuana twice this month. People who do not stay in the shelter lurk outside to sell the drugs, administrator Douglas Page said. People believed to be under the influence of the drug have attacked staff members and just this weekend smashed an office window. "It's a physical threat to not only our residents but to visitors and everyone else," Page said. Case manager John Cleveland said he fears for his life when he leaves the office. "It makes them stronger," he said. "Very violent." The unregulated, highly addictive drugs can cause psychotic episodes, aggressive behavior and seizures, according to the American Association of Poison Control Centers. "Synthetic drugs are extraordinarily serious. They're in fact deadly," D.C. Assistant Attorney General Argatonia Weatherington previously told News4. District officials are cracking down on synthetic drug suppliers, not the users, Washington Post reporter Abigail Hauslohner told News4 on the air Tuesday. She reported about mass drug use outside the CCNV shelter. "It really was shocking to see so many people using the drugs and also apparently selling the drugs right out there just a few blocks from police headquarters," she said.